The Huge space between galaxies is not completely empty, it is inhabited by some stars which were flung far away from any other galaxies or stars and lost forever in the dark region of intergalactic space. These stars lives in solitude far enough from their nearest neighbors. In the distant past, these stars were most likely part of a galaxy — a home to hundreds of billions of stars — before being ejected away often in collision of two or more galaxies but sometimes even by supermassive black holes. These solitary distant stars live their lives like other ordinary stars continuing their life cycle, which can sometimes end quite spectacular. The vast majority of stars — 90% of the stars in the universe, like our Sun — belongs to what is called the main sequence stars. A star of this type will fuse its hydrogen into helium in nuclear fusion reactions and once this hydrogen exhausted, it reach the end of it life cycle, it will become a red giant star fusing helium into carbon in it core. At this point, it leaves the main sequence. Because the star does not have sufficient mass for carbon fusion to occur it collapses, shedding it’s outer layers into a ring known as a planetary nebula, the core that is left behind will be a white dwarf. If this white dwarf has a close companion, especially if it is a giant star, a phenomenon of “cannibalization” may occur. The white dwarf can ‘steal’ extra hydrogen from its companion by tidal stripping while increasing its own mass. If it exceeds a certain limit, the pressure and density of the hydrogen outer shell will reach the point where fusion can begin and the shell explodes in a burst of energy: it becomes a supernova, a type that astronomers have named type Ia supernova. These Ia supernovae are important in astrophysics: they are benchmarks used by astronomers to calculate distances in the universe. 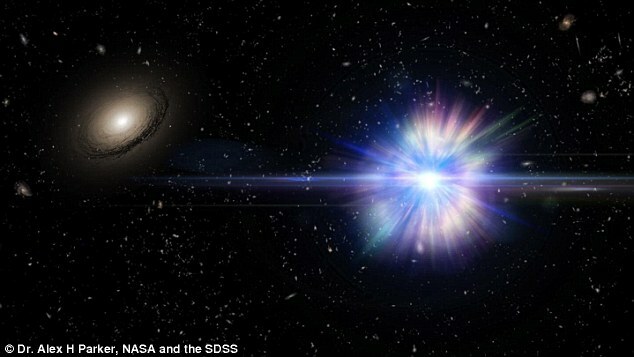 Artist illustration of Type Ia supernova exploding in intergalactic space. © Alex Parker / NASA / SDSS. This is no love story, though. The companion was either a lower-mass white dwarf that eventually got too close and was tragically fragmented into a ring that was cannibalized by the primary star, or a regular star from which the primary white dwarf star stole sips of gas from its outer layers. Either way, this transfer of material caused the primary to become unstably massive and explode as a Type Ia supernova. Like other stars, most of the known supernovae have been identified within the galaxies. However, recent observations with Hubble Space Telescope confirm that 3 stars exploded as Type 1a supernovae in the vastness of intergalactic void. The study, led by Melissa Graham, has determined that threse supernovae — about a billion light-years from Earth — each located over 300 light-years from any other companion, died and exploded alone. Since there are far fewer stars in globular clusters, only a small fraction of the supernovae are expected to occur in globular clusters. This might be the first confirmed case, and may indicate that the fraction of stars that explode as supernovae is higher in either low-mass galaxies or globular clusters. It would have been a fairly dark background indeed. Populated only by the occasional faint and fuzzy blobs of the nearest and brightest cluster galaxies. We have provided the best evidence yet that intracluster stars truly do explode as Type Ia supernovae. and confirmed that hostless supernovae can be used to trace the population of intracluster stars, which is important for extending this technique to more distant clusters. Such rare solitary supernovae provide an important clue to what exists in the vast empty spaces between galaxies, and can help astronomers understand how galaxy clusters formed and evolved throughout the history of the universe.